Do you wish you had a rainbow pad once in awhile? Here's a way to make rainbows of any color. 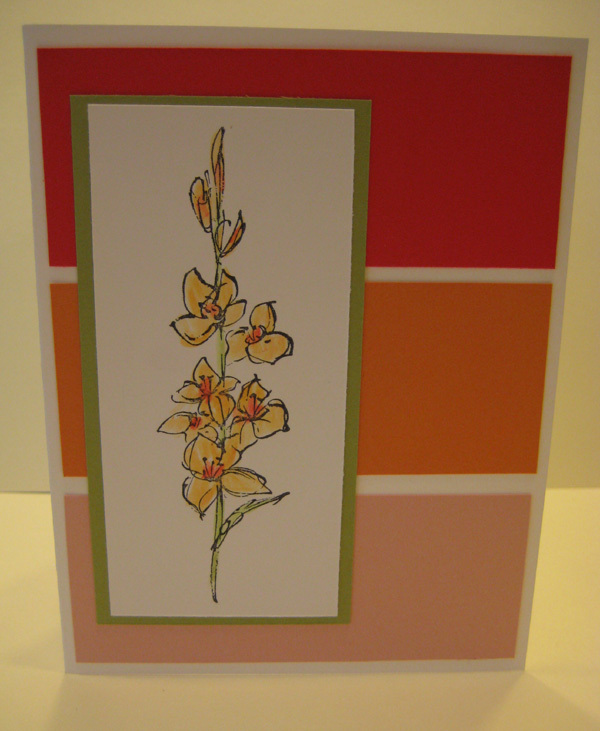 Start with your lightest color, and with Post-it Notes, mask off the rest of the card so you can sponge on the color. Move your mask over as you darken the colors. 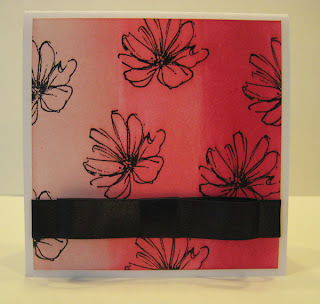 In stamp club, we tried it on glossy and on plain white cardstock. 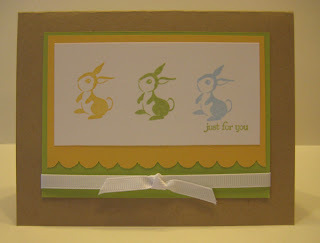 You could also use Post-its on both sides of the section you are sponging if you want a more defined line. I heat embossed the flowers first before sponging, and I am sorry the cute little ribbon doesn't show up well in the photo. 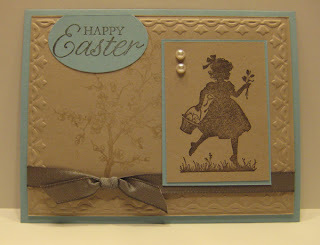 Here's the last of April's stamp-a-stack cards. I used in colors and the hostess set Fast and Fabulous. I designed it as a multipurpose card, but I thought that it could double as an Easter card for anyone who wanted to make more than three. I actually designed it awhile ago for a different stamp-a-stack, but I thought it was just too springy for our cold snowy winter. So I held on to it and this was the month! This card does double duty. 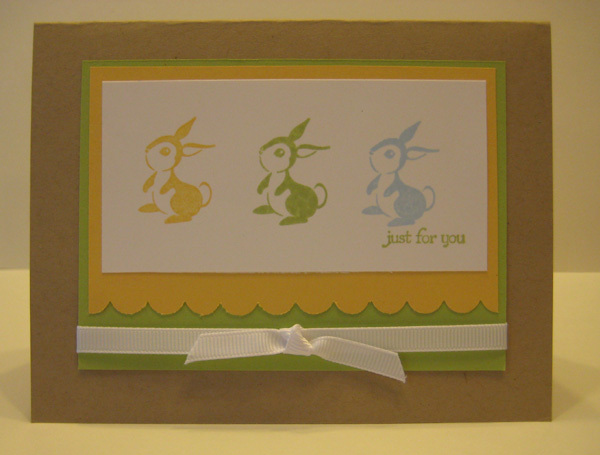 I designed it for my last stamp-a-stack as an Easter card, but I put some baby stamps out too. The ladies did it both ways and they all turned out great. And you thought you could live without this die? 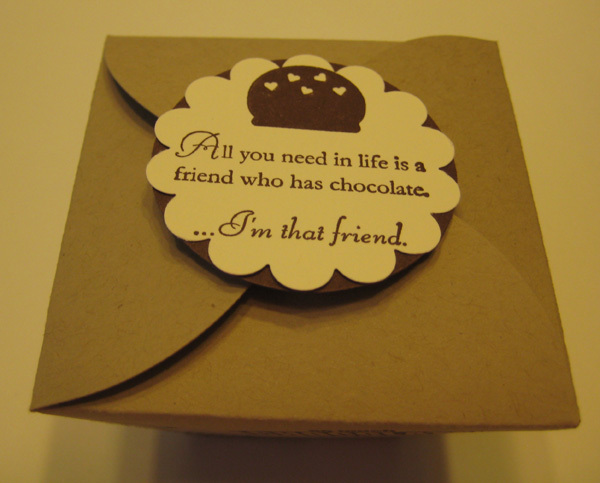 There are so many clever people out there coming up with some cute ways to use this die. I saw this at a recent stamping event and had to come home and try one of my own. 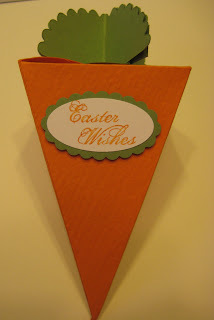 Now all it needs are a few little candies and I am ready for the Easter Bunny! 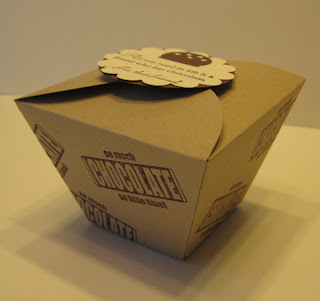 Hard to believe this cute little takeout box is made from the Petal Cone Die from the Occasions Mini Catalog isn't it? That adds a whole new world of possibilities for that die. I spent some time last week in Georgia for my good friend's wedding. I had a great time and it was a beautiful day for an outdoor wedding. But when I got home, it took me a few days to get back into the swing of things. I had a stamp club and a stamp-a-stack so I have plenty of projects to post for you in the next several days. 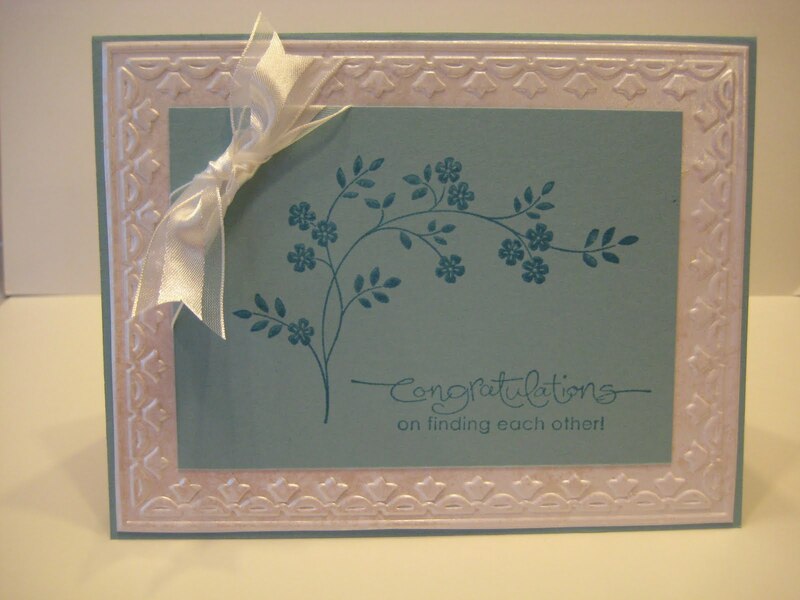 Here's a Faux Mother of Pearl wedding card we did in club. 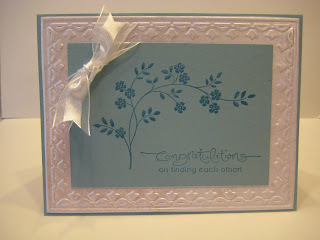 I made one for Beth and Kirk but used a retired cardstock that fit her wedding colors perfectly. This one uses Baja Breeze and Marina Mist. The Tulip frame turned out to be a great choice if you notice my bouquet is all ivory tulips. 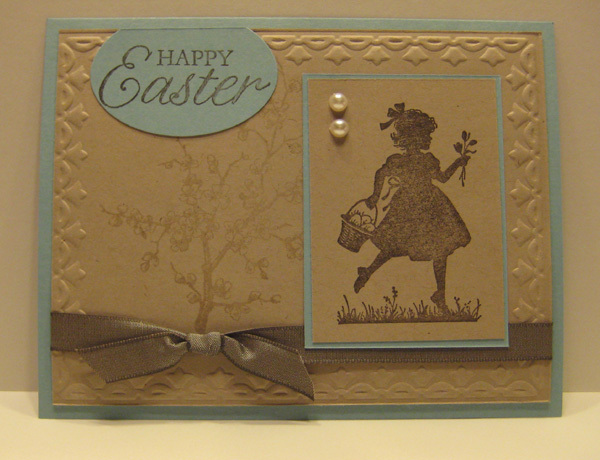 Here's another beautiful Easter Blossoms card from the swapping I did last weekend. My friend, Cathy Roy, created this lovely card. She and Mary always make such nice cards, but isn't it funny they both chose the same basic color palate for this set. I loved each of their cards and am so glad to be a part of such a creative and talented group of stampers. I have a pile of swaps at home and a camera full of pictures of equally great cards. Here is one of my favorite swaps from last weekend made by my friend, Mary McNeely. 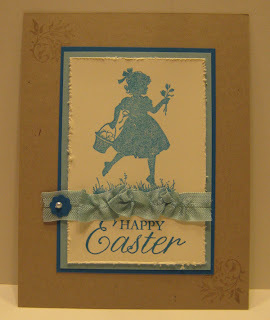 Easter Blossoms is in the Occasions Mini Catalog and makes just beautiful cards. 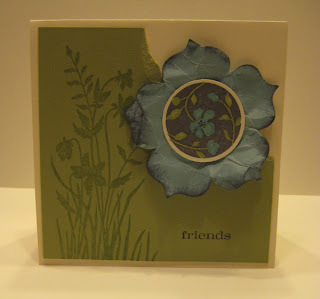 I had a great time with my stamping friends Friday night and all day Saturday as I do every year at Spring into Stamping, and I came home with some great ideas, swaps and make-n-takes. Here is one of the great make-n-takes we did. My newsletter comes out Tuesday and you'll get a peek at another of the projects Julie Davison designed for us. If you don't get my newsletter, sign up in the side bar for a monthly specials update and upcoming events newsletter. While supplies last, you can purchase special "grab bags" in the Online Store. These grab bags will come in three sizes: the $5, the $10, and the $15 grab bag. Each bag will contain a variety of discontinued products that could include a combination of any of the following: ribbons, Accents & Elements, chipboard, Designer Series Papers, and Simply Sent kit components. Grab bags will not contain stamp sets or tools. -Grab bag orders can only be placed in my Online Store. -There is no minimum purchase required to participate in the grab bag special offer. -There is no limit to the number of grab bags a customer may purchase; however, grab bag items are only available while supplies last. -All grab bag sales are final. There are no refunds or exchanges. -Not all grab bags will be unique. You'll also want to check out the updated Clearance Rack!